The following report on the "incident" in the second game of the 50th Oza title match was written by John Fairbairn. Game 2 resumed at nine o'clock in the evening after dinner. Reporters idly watching the players on the monitor in the press room on the third floor of the hotel, suddenly saw, at 9.30, a hand movement by Cho Chikun that led them to believe he had resigned in an unresignable position. Unable to comprehend what was happening, they all rushed pell mell downstairs to the playing room. What they found was indeed an unimaginable "incident". Cho had lost on time after 144 moves while ahead and under no pressure - except of course the self-induced pressure of being yet again in overtime early in the game, this time from move 121. A disconsolate Cho was telling the referee and scorekeeper: "I didn't realise it was my move. I thought it was O's move. Was it my move?" He admitted he thought it was strange when the scorekeeper (Yamamoto Kentaro 4-dan) started counting out the final seconds, and was on the verge of querying it... maybe he'd missed hearing that O was in overtime too? Then he hung down his head, rubbing his eyes with the back of his wrist as he sat glued to the board. Again he raised his head in dismay: "Was it my move?" The head drooped again - he struck himself on the cheek with his fan, muttering, "Why, why?" His inadvertently victorious opponent, O Meien, was also a picture of consternation. Of course he had known it was Cho's move, but he had been engrossed in preparing his own next move. He had been lost for words when the flag fell. As referee Sakaguchi Ryuzo 9-dan surveyed the position, O could barely croak, "Yes, I was behind." Sakaguchi too was clearly affected by the general confusion. 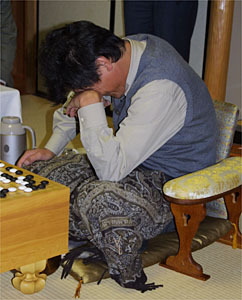 Though the live web broadcast announced the result at around 9.45, it was not until five minutes after that Sakaguchi said, "Black has run out of time, and so we have to assume White wins." It was not the most official of official pronouncements. But then nothing like this had ever happened before. It appeared afterwards that Cho had already decided on what his move 145 would be - indeed he had already seen the path to victory - and was looking down into his lap. He had not noticed that O had played. But he was in no fit state to go through the usual post mortem and so not much more than that was revealed. Instead, he quickly left the playing room, silently and apparently with tears welling up in his eyes, as soon as Sakaguchi had indicated his likely decision. The referee and the reporters repaired back to the press room, still debating whether Cho had to lose. In the end they agreed he did.